This entry was posted on 29 June 2017 by Filippo Bradaschia. 1) The star tracker is installed on a normal photo tripod, it's small and lightweight so it is easier to transport. But it has a much lower load capacity than a real equatorial mount. This generally means that you can install DSLR camera with telephoto lenses but hardly telescopes (except those that are particularly compact and light). 2) The equatorial mount is larger and heavy but also more stable, so it supports not only real telescopes but also the heaviest telephoto lenses withDSLR camera. On the other hand, they are more difficult to transport even if are available compact models and bags to facilitate transport. 3) a star tracker usually has a single axis motor (the AR one) while the equatorial mount can be motorized in both axes (AR and DEC) and may also have an ST4 auto-guide port. Then the equatorial mount can be equipped with an autoguide system that corrects the normal tracking errors of the equatorial mount. Even the Star Adventurer has an autoguide port, but with only the Right Ascension motor, the autoguide works only in this axis and fails to perfectly correct the tracking errors (which of course occur also in Declination axis). 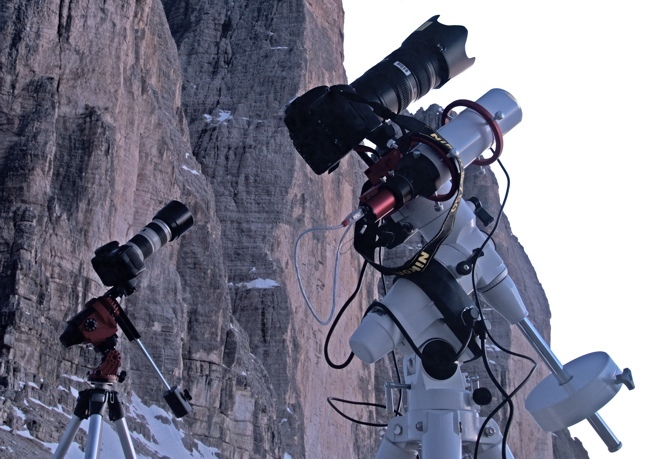 4) Equatorial mounts, especially if they are computerized, cost more than the Star Adventurer but have advanced features such as automatic goto thanks to an integrated database of many objects (eg the SkyWatcher equatorial mounts have a database of more than 40,000 objects). This allows you to automatically point to the objects we want to photograph, while with a star tracker you need to manually point them and then perfectly know the position in the sky. 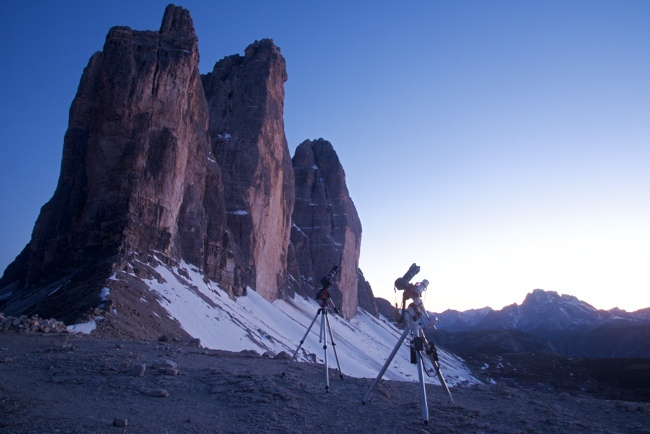 In order to compare the performances of Star Adventurer and EAGLE CORE we moved to one of the most beautiful places in the world, the Tre Cime di Lavaredo in the Dolomites having with us a Star Adventurer installed on a solid photo tripod with the dedicated equatorial head (that allows for precise polar alignment) and the EAGLE CORE complete kit with SkyWatcher EQ5 equatorial mount. 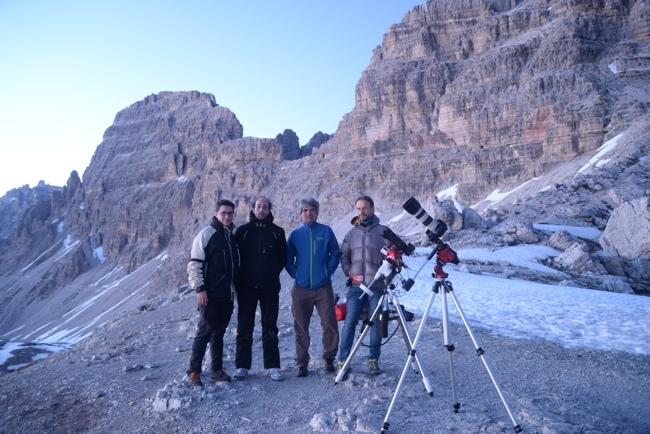 Star Adventurer versus EAGLE CORE kit: thanks to high transportability of Star Adventurer and EAGLE CORE kit we were able to reach places usually not possible with normal telescopes! 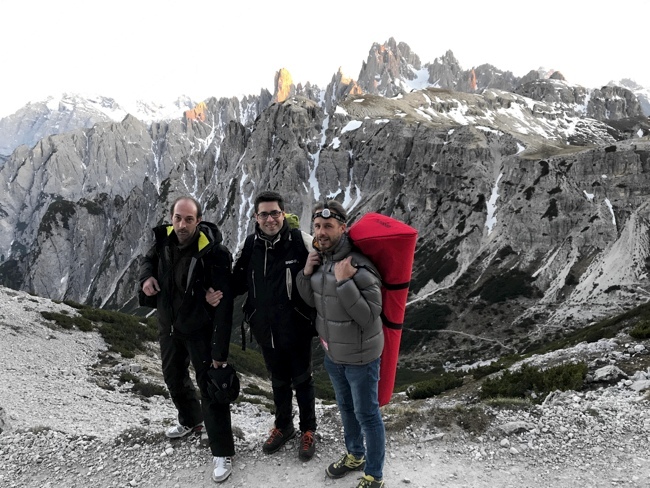 Both the Star Adventurer and the EAGLE CORE kit are much more portable than a classic telescopes, so thanks to Geoptik transport bags, we could walk on the path that connects the Auronzo hut (where we left the car) to Forcella Lavaredo that we reached in about 1 hour. 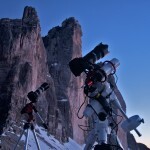 So we prepared both instruments and waited for astronomical twilight to start astrophotography. It is true that these are not VERY compact tools but they have proved to be easily transportable allowing us to reach fantastic places and with very little light pollution. We started our test by making the most accurate Star Adventurer polar alignment thanks to the dedicated dedicated equatorial wedge. Then we installed the Nikon D750 camera with theNikon AF-S 70-200mm f/2.8 G ED VR telephoto lens (set at 200mm f/4) and started shooting the star Alkaid in the Constellation of the Big Bear (center in the below picture, in the upper right you can see the M51 galaxy, the left galaxy M101). Our StarAdventurer allowed us to record up to 2 minutes of exposition time, the 3 minutes picture shows the stars clearly elungated (picture below). Star Adventurer versus EAGLE CORE kit: with 3 minutes exposition time the stars looks like trails and the picture is no good! We then installed the Nikon D750 withNikon AF-S 70-200mm f/2.8 G ED VR telephoto lens (always set at 200mm f/4) on the EQ5 SynScan mount with the EAGLE CORE kit and made a series of longer exposures. The built-in autoguide system allows EAGLE CORE to automatically correct tracking errors. Thanks to this system it is possible not only to take longer exposition images but also to take a sequence of many photographs that can then be stacked together during processing. In this way, we can photograph very weak objects and therefore we wanted to record the entire Nebula Veil in the Swan, thanks to the huge Full Frame (36 x 24mm) sensor of the Nikon D750. We recorded 6 images of 5 minutes each, then we stacked them to get the result below. 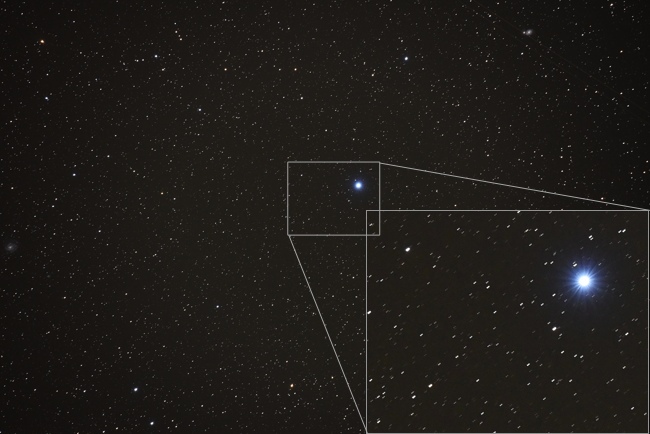 As you can see from the enlarged area, tracking is perfect and stars are perfectly point-like. 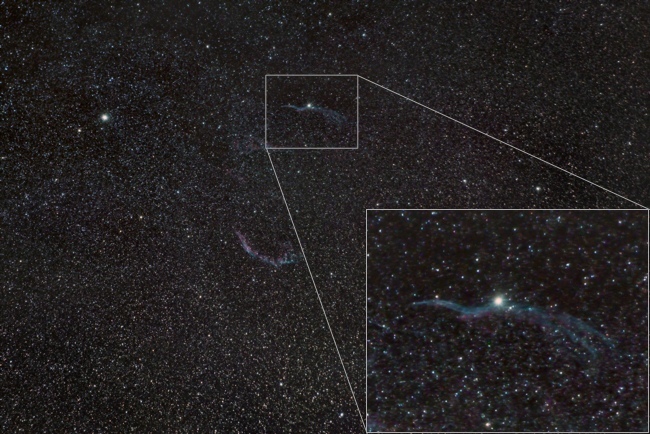 Star Adventurer versus EAGLE CORE kit: Veil Nebula image with della Nebulosa Velo Nikon 200mm f/4 telephoto lens, EAGLE CORE and EQ5 SynScan mount, sum of 6 pictures 5 minutes each. SkyWatcher Star Adventurer is surely the most portable instrument you can find and use for long exposure astrophotography but is also limited in the length of expositions you can record and the weight (camera + telephoto lens) that it can load. EAGLE CORE along with a compact equatorial mount is less portable than a Star Adventurer but it offers a very high tracking accuracy, equal to the one you can get by a real astrophotography telescope. In addition, the use of a computerized equatorial mount makes it easy to point the objects to be photographed, which can also be done by connecting EAGLE CORE to the mount and using the SkySafari app to point the objects from your smartphone or tablet, as we had already shown in this article. With the Star Adventurer, pointing (and focusing on the image) are definitely more complicated and we were often lying on the ground trying to point the object in the sky! EAGLE CORE, at a higher price than a Star Adventurer, therefore offers superior performance and is therefore not only for anyone looking for a photo system without any limitation but also for those who already have a Star Adventurer and want to take pictures with better results!